Smart Power™ 75W is a lightweight, electronic power supply that is competitively priced. These units used to be on our demo inventory. The first unit sold with be sold in original packaging. The second unit sold does not have the original unit box. 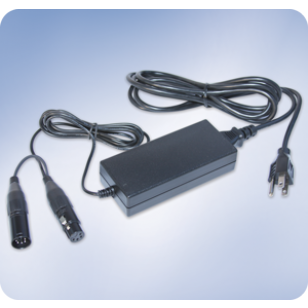 Smart Power™ power supplies provide 24 VDC to lighting accessories such as Smart Move® rotators and Smart Color® scrollers as well as control indexing devices with a DMX signal. - 100-240 volt input, 24 volt output, - 3.12 Amps, - 47-63 Hz, -75W max, - Includes 5-pin male XLR: 4-pin female XLR, -Powers up to 1 MXR color mixer, 2 Smart Color® scrollers, 5 Smart Move® rotators, or a combination of these products., - Dimensions: 7" (H) x 3" (W) x 1" (D) OR 177.8mm (H) x 76.2mm (W) x 25.4mm (D).